This past weekend I found myself in Philadelphia holding a near courtside seat for what I thought would be my first Georgetown Hoyas basketball game of the year. Despite my relative proximity to D.C.’s Verizon Center, I somehow managed to miss every single home game this season, always promising I’d attend the next one. So I stepped up to the plate this time. I bought a ticket for Sunday’s third round matchup in Philly which would pit Georgetown against either San Diego State or Oklahoma. Sure, the Hoyas had to beat this one little school first, that being Florida Gulf Coast, but I pretty much figured that was a given. Needless to say, FGCU is now the most widely uttered acronym after the 15-seeded Eagles of the 20-year old institution shocked the hoops nation while upsetting the Hoyas and San Diego State, becoming the lowest seed ever to qualify for Sweet 16 and doing rightful justice to the term “March Madness”. I can’t say I was upset to see FGCU play instead of the Hoyas – despite picking the Hoyas all the way to the title game. I mean, I’ve always relished the underdog, the big upsets, the Cinderella stories. Sure, this came at the sacrifice of my favorite squad, but, in the moment, I’m happy to for the little guys. So I drove up to Philly anyway, all dressed up in Georgetown garb (I didn’t have much choice, I packed two sets of clothes Friday after work as I drove to stay with family in Delaware – listening to the FGCU beatdown of Georgetown on the radio). Oh – the ticket – yeah, it was only a second row seat…situated right next to where the Georgetown band would have likely been. I know a couple of the band members from work (in fact, one was my buddy who went down to Panama in the prior blog) and figured I’d get a seat close to them. In the end, I was easily the only Georgetown fan I could see (I encountered one in the crowded walkways of the Wells Fargo Center) and I stuck out – especially when I got on TV. At halftime of each game (Duke-Creighton was the nightcap), Lewis Johnson conducted an interview with a coach right near where I was sitting. 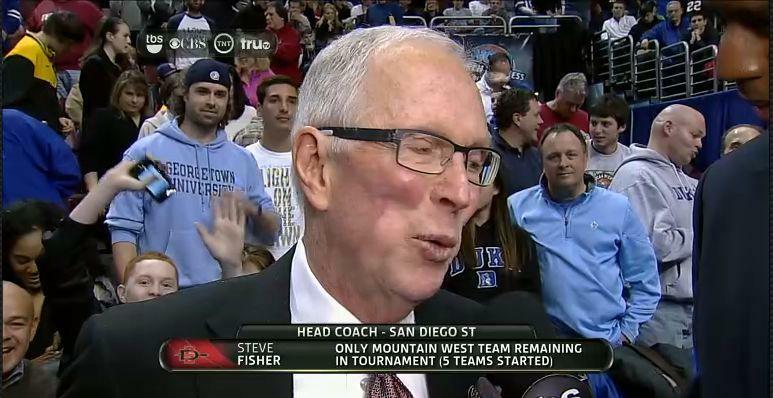 First up was San Diego State’s legendary Steve Fisher – and there I was, taking up most of the screen to his right (left on the image) in my baby blue Hoya hoodie. Later in the night, TBS questioned Creighton coach Greg McDermott and I decided to sneak my way into view, flashing (heck, pimping) my Georgetown sweatshirt for all to see. I mean, why not. You never know who is watching back home, right? I got some kudos for the display when I got back to work on campus (from both students and fellow staff), but I was curious to see what the Twitterverse had to say. I searched “georgetown shirt” and “georgetown fan” and saw that a few people took note – some harshly – at my public post-FGCU support of the Hoyas. Here are a few of the PG-rated tweets (PS – Yes, it’s incredibly strange to be tweeted about). A guy in the background of the announcers at the duke vs. creighton game had a Georgetown shirt on and was pointing at his shirt.. Lol dude. There is a guy at the Duke Creighton game wearing a Georgetown shirt n he popped it n put his pointer finger up as if he was indicating #1..
Couldn’t help but smile at the guy at the FGCU game wearing a Georgetown shirt. just saw a fan on tv pointing at his hoodie, which says georgetown. wonder if he realizes they were the biggest disappointment this weekend? Womp womp RT @ericj_d: Some bro just popped his Georgetown sweatshirt in the background of the Duke game. 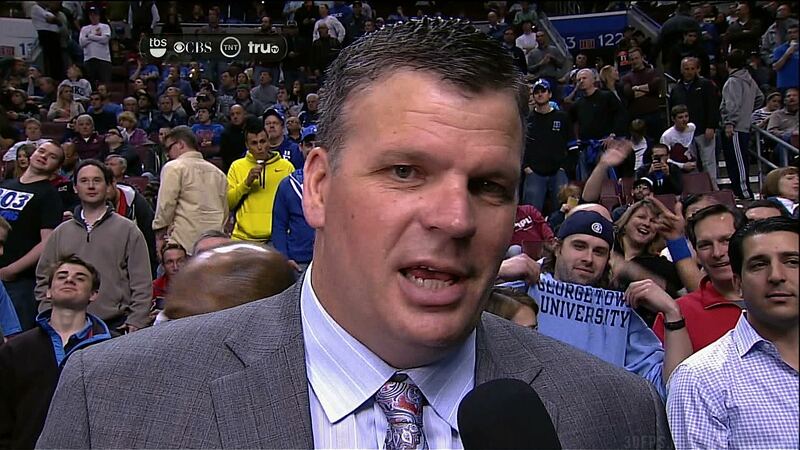 A guy behind Coach McDermott while he was being interviewed just popped his Georgetown hoodie. Seriously. Really!?! This Dude Is Repping Georgetown Like They Still In The Tournament. Word up to the guy in Philly at the Florida Golf Coast/San Diego State game in a Georgetown hoodie. LOL at the guy wearing a Georgetown hoodie to the FGC/SDS game. Soo where’s George town? Because there is a reaaally hot guy in the audience with a Georgetown sweatshirt on. Did anybody see that guy wearing a Georgetown sweatshirt at the FGCU game ? The last one is Timothy Burke of Deadspin fame. I’m apparently now a part of 30fps infamy forever. The world is a scary place! Big Brother is watching! Oh, and go Hoyas! As I wrote on the D.C. Sports Bog, this looks much better — and is actually kind of endearing — with the backstory. Thanks for it. Thanks Keith. Truth be told, I had that moment where I thought, “Oh man, people might’ve thought that was really dumb” after popping the shirt. After I saw the little stir it created, I thought it deserved some explanation. Jed it’s funny you mention that – my girlfriend is a UND grad and I’ve attended a handful of Sioux games and might even go to Pittsburgh if they somehow get all the way to the title (if they don’t, should I still go, haha?). I, too, noticed they stuck around for the rest of the tournament. They are a diehard bunch. I still feel bad for suggesting FGCU had a chance to win before the game. Although if I did jinx Georgetown it seemed to work out for the best. By the way that’s always what it’s like to wear Cubs stuff. Everyone always pities you and feels bad.